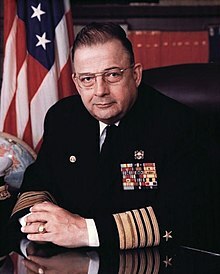 Admiral Isaac C. Kidd Jr.
Isaac Campbell Kidd Jr. (August 14, 1919 – June 27, 1999) was an American admiral in the United States Navy who served as the Supreme Allied Commander of NATO's Atlantic Fleet, and also as commander in chief of the U.S. Atlantic Fleet from 1975 to 1978. He was the son of Rear Admiral Isaac C. Kidd, who was killed on the bridge of the battleship Arizona during the Japanese attack on Pearl Harbor. In 1978 Kidd was among a number of retired four-star officers who testified before Congress in favor of the controversial SALT II arms control pact. Born in Cleveland, Ohio, Kidd graduated from the U.S. Naval Academy in 1941; he was commissioned an ensign on December 19, 1941, just 12 days after his father was killed aboard his flagship. As Time Magazine described the event, when Kidd received his commission as ensign "the U.S. Naval Academy and its guests broke into a thunderous cheer— an unprecedented demonstration in honor of Ensign Kidd and his father." During World War II he served as a gunnery and operations officer on destroyers in both Europe and the Pacific, and participated in various Allied landings in the Mediterranean as well as at Iwo Jima. His 23 years at sea during his 40-year naval career included 15 years in command of destroyers, destroyer divisions and squadrons and three U.S. fleets in the Atlantic, Pacific and Mediterranean; he also served as executive assistant and senior aide to the Chief of Naval Operations in the early 1960s, earning citations for his efforts in the Cuban Missile Crisis and several other crises. In 1967, he headed the court of inquiry into the USS Liberty incident during the Six-Day War in June of that year. From 1975 to 1978, Kidd served as Commander in Chief of the U.S. Atlantic Fleet. Shortly after his 1978 retirement, Kidd was among a number of retired four-star officers who testified before Congress in favor of the controversial SALT II arms control pact. Kidd declared that while he was not entirely thrilled with the proposed treaty's verification procedures, "the alternative of having no ceiling at all, considering our position at this point in the so-called race, I find totally unacceptable." He also taught the law of the sea at the College of William and Mary. His six children included Navy Captain Isaac C. Kidd III. Kidd died of cancer at age 79 at his home in Alexandria, Virginia, and was buried in the Naval Academy Cemetery. ^ "June in December," TIME, 1941-12-29. ^ "A Brief History Of The U.S. Fleet Forces Command". United States Fleet Forces Command, United States Navy. Archived from the original on 2006-10-05. Retrieved 2006-10-06. This page is based on the Wikipedia article Isaac C. Kidd Jr.; it is used under the Creative Commons Attribution-ShareAlike 3.0 Unported License (CC-BY-SA). You may redistribute it, verbatim or modified, providing that you comply with the terms of the CC-BY-SA.